Nexo I Launch: T-2 Days! Danish amateur rocket builders launch their most advanced rocket yet. 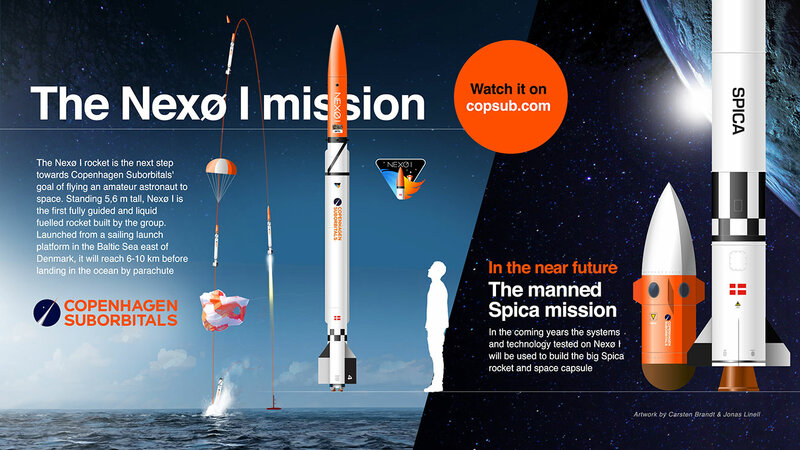 This summer, Copenhagen Suborbitals are launching the Nexø I rocket, as the next step towards their goal of flying an amateur astronaut into space. The rocket is the first of the Nexø Class to fly, named after the city of Nexø on the Bornholm island that hosts the Danish spaceport. Standing 5,6 m tall, Nexø I is the first, fully guided and liquid fuelled rocket built by the group. Launched from the Mobile launch platform Sputnik on the Baltic Sea east of Denmark, it can fly up to 6-10 km before landing back in the ocean by parachute. Copenhagen Suborbitals have built and launched rockets from Denmark since 2011, when their HEAT-1X made headlines as the biggest, amateur rocket ever flown. The group is the world’s only manned, amateur space programme, with 55 volunteers building rockets and space capsules in a central copenhagen workshop, all completely crowdfunded. “Nexø I will not fly into space, but the technologies we are testing are the same needed to build our manned rocket, Spica” says Kristian Elof Sørensen. “The Spica rocket is so big that it makes sense to build smaller rockets first to test the subsystems on a smaller scale”. The flight will happen between July 23rd and September 1st, with the actual date depending on weather conditions. The first possible launch window is Saturday july 23rd. Stay up to date with this weekend’s launch of Nexo I, the launch will be live streamed and all information can be found on the Nexo I rocket mission page.